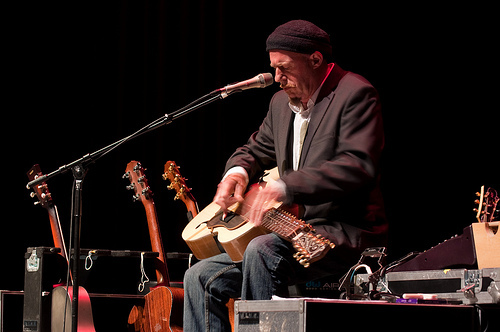 Harry Manx has been called an “essential link” between the music of East and West, creating musical short stories that wed the tradition of the Blues with the depth of classical Indian ragas. Add a sprinkle of gospel and some compelling grooves and the result is a “mysticssippi” sound that is deliciously addictive to listen to. His hypnotic live show was honed on street corners, cafes, bars and festivals worldwide. A five-year tutelage in India under Rajasthani musician Vishwa Mohan Bhatt (Grammy winner with Ry Cooder for A Meeting by the River) learning the mohan veena (a 20-stringed sitar/guitar designed by Bhatt) was the catalyst for Harry’s now signature style. The prolific Manx has released ten albums in a ten-year span. Manx has just released a compilation CD, Isle of Manx. He also has just completed a third CD collaboration with guitarist Kevin Breit, which will be released on Stony Plain Records in the spring of 2011. Hi Harry from a fellow BC artist. We are new here and just finding our way around the site. I have just set up my first station and will add you. Welcome. Let me say how much I appreciate your fine musicianship. Really enjoyable to listen to. You will do well here at IAC Harry Manx. * Your song 'A Single Spark' has just been added to ROCK ON BLUES (KROB) station! * Your song 'Your Sweet Name' has just been added to FULL MOON MUSERS station! Neubeatz Heh, got a bootleg of yours kicking around the room at home, good to c u here in teh flesh!!! * Your song 'A Single Spark' has just been added to SqurlyMurly Favorites #2 station! * Your song 'Your Sweet Name' has just been added to enigmaticsky station! * Your song 'A Single Spark' has just been added to enigmaticsky station! * Your song 'Your Sweet Name' has just been added to The Global Village station! * Your song 'Your Sweet Name' has just been added to John Miles presents The Blues station! * Your song 'Your Sweet Name' has just been added to Ruling 11 station! * Your song 'Your Sweet Name' has just been added to Elder Statesmen of the Ruling 11 station! 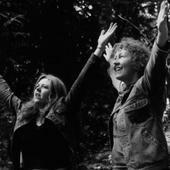 * Your song 'A Single Spark' has just been added to Feathers and Butterflies station! * Your song 'A Single Spark' has just been added to RIDE THE RIVER station! * Your song 'A Single Spark' has just been added to RIDE THE RIVER II station! * Your song 'Your Sweet Name' has just been added to RIVER ROCK & BLUES station! * Your song 'Your Sweet Name' has just been added to RPW Radio station! * Your song 'A Single Spark' has just been added to entropy station! * Your song 'A Little Cruel' has just been added to What the Folk! station! * Your song 'A Little Cruel' has just been added to MWM2 station! * Your song 'A Little Cruel' has just been added to LEGENDARY MUSIC station! * Your song 'A Little Cruel' has just been added to Lets hear that again. station!